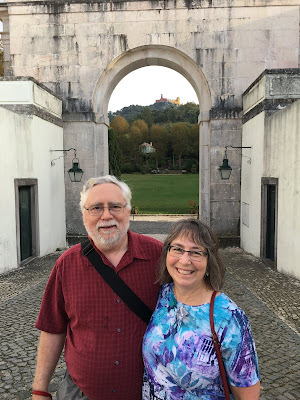 We have been doing a fifteen day tour of Portugal. 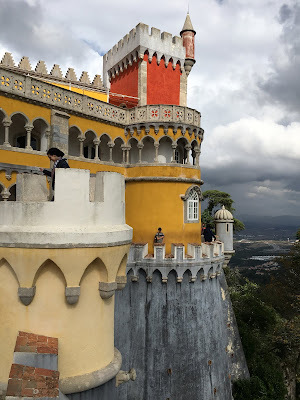 After five days in Lisbon, we went to to Sintra for two days. The Vila de Sintra is a city in the municipality of Sintra, located in the Sintra Mountains on the west coast. The area is a UNESCO World Heritage Site because of its historical importance. This area just north of Lisbon is also known as the Portuguese Riviera. We stayed in a small b&b in the town of Sintra, and spent the first day exploring the area on foot. We hiked through the town past the municipal administration building, some large gardens, the National Palace Of Sintra (which served as the summer palace for royalty for a couple of centuries until the end of the 1600’s), and the Quinta da Regaleira (which unfortunately had just closed to visitors by the time we made our way there). The photo above shows a small alcove along the main roadway. 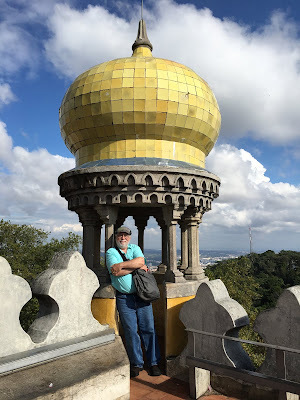 Near the Quinta da Regaleira, we took in the view over the Vila de Sintra. 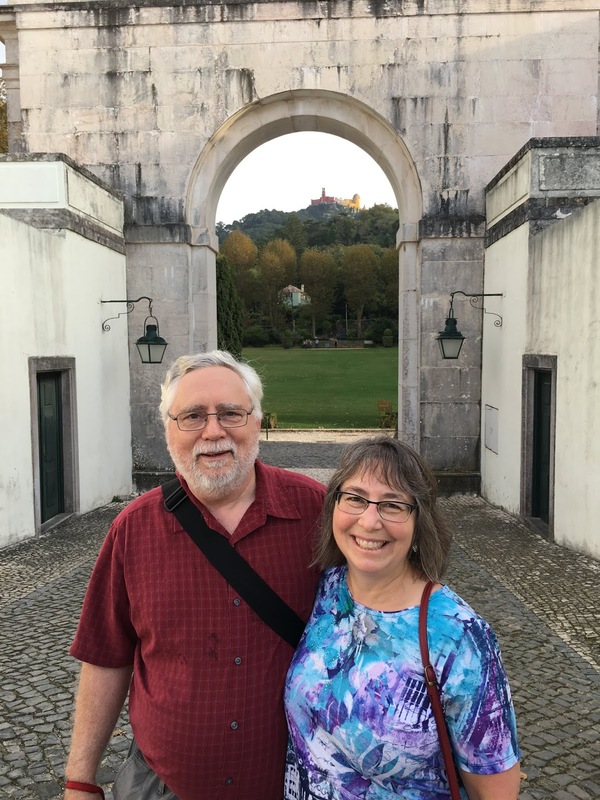 Looking in the other direction, through the arch behind us you can see the Palace of Pena on a nearby mountaintop. 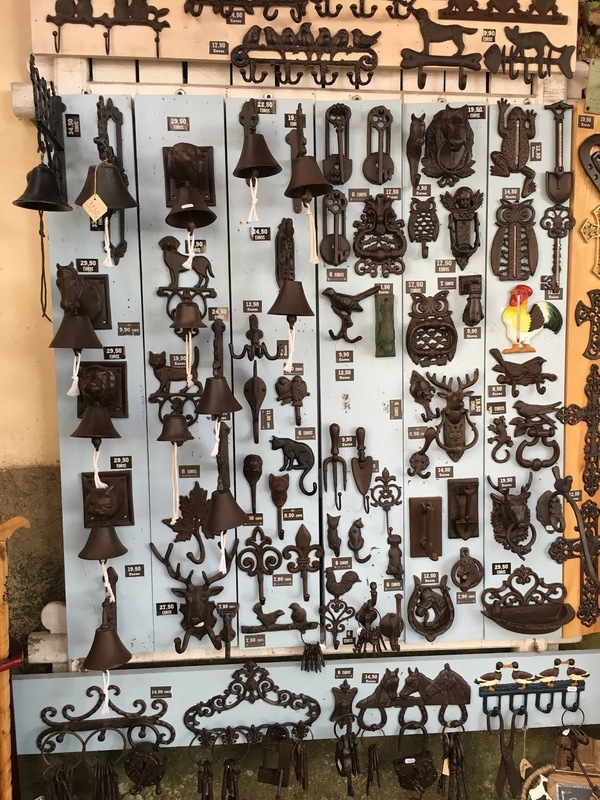 Throughout Sintra, there were many stores catering to tourists. 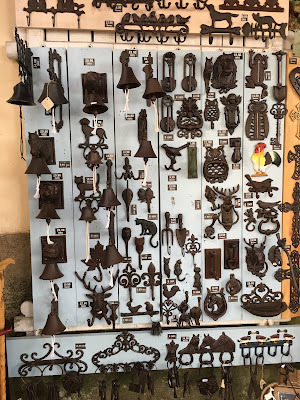 For example, these iron items looked interesting, although a little heavy to transport home via airplane in a suitcase. On the second day, we bought tickets for the “hop-on-hop-off” bus, and boarded it to take us to the Castle of the Moors on one mountaintop above the city, and the Palace of Pena on another nearby peak. 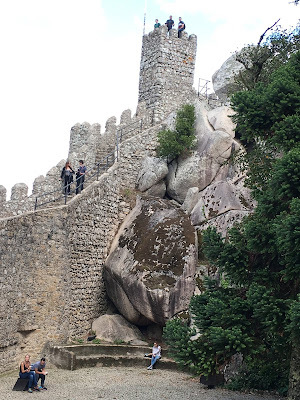 It is also possible to hike up to the castle via a walking trail and then over to the palace, although it would be a long, steep route. The road was very narrow with many switchbacks to get to the top. We were amazed to see how the well the bus driver negotiated the narrow twisty road, and were glad we had left the rental car parked down below. The Castelo dos Mouros was a military fort built in the tenth century during the time that the Moors occupied the Iberian peninsula. In this photo, you can see the keep. From the castle, you get a good view of the Palace of Pena. The views in all directions from the castle are amazing. We climbed up and down many stairs as we hiked around the castle. This photo shows the castle wall going from the keep to a second high point. I walked all along the castle wall, even though the ground fell away below in a rather breathtaking way. Rob took an alternative route to the far side. 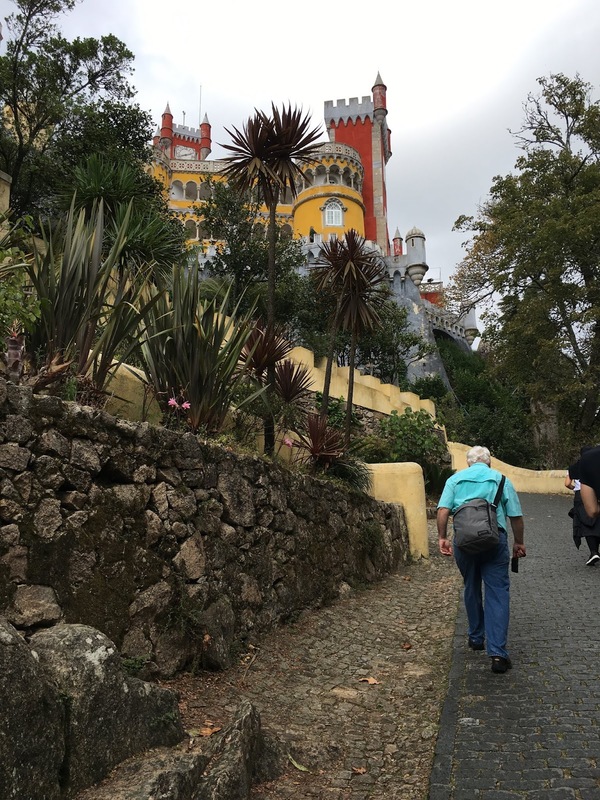 After exploring the castle, we hiked back out the road and hopped on the bus again, which dropped us off at the wall around Pena Palace. 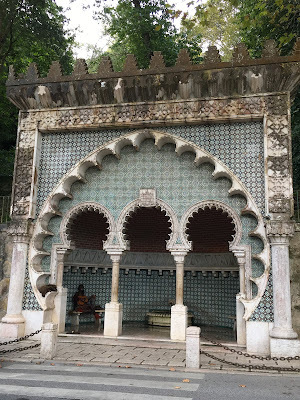 Pena Palace is built upon the foundation of a former monastery on the site, and it incorporates many elements of the former building. It was built under the initiative of King-Consort Ferdinand and Queen Maria II in the mid-1800’s. It is considered to be the preeminent example of Portuguese Romantic architecture. From the wall around the palace to the palace itself there was another long hike up a hill through the Pena Gardens. If we had been so inclined, we could have paid 3€ each and ridden up in a shuttle bus. But we walked, needing to balance some of the eating we had been doing with some vigorous exercise. We certainly achieved more than our 10,000 steps on this day. 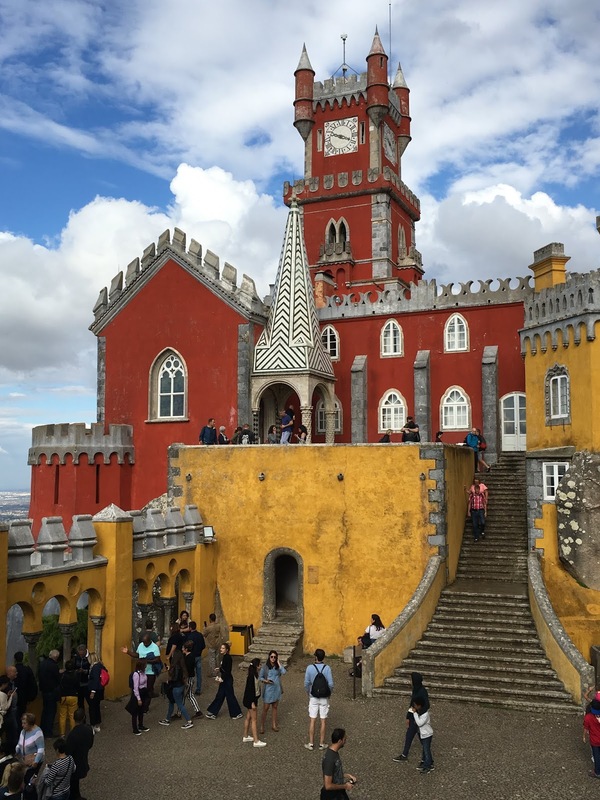 Pena Palace is like a fairytale palace, and it is equally beautiful on the inside. From the palace, there are fabulous views over Sintra and the mountains nearby. The photo above is of a small niche in the interior. 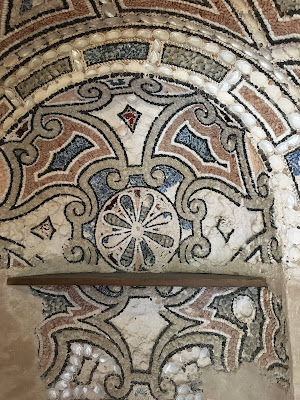 The wall mosaic dates from Moorish times. 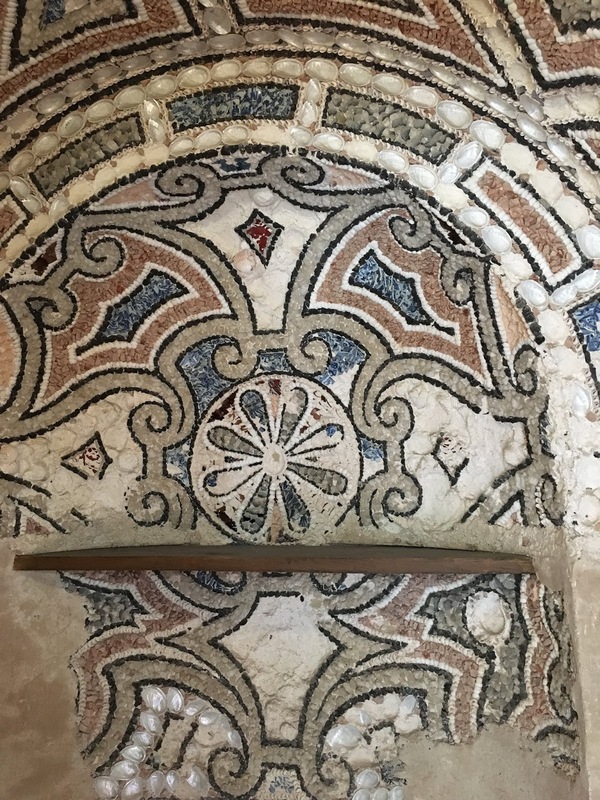 If you look closely, you can see that seashells were used in the mosaic pattern. Later, this space was used as a storeroom for the palace. Some brave souls were doing the exterior wall walk. Not I. 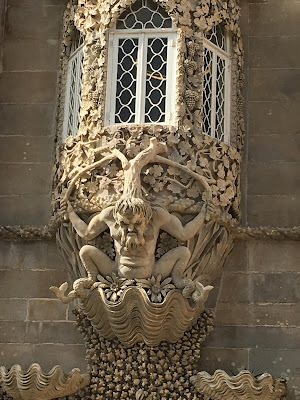 There were elaborate carved details throughout the palace. Above you can see a representation of Triton, god of the sea. 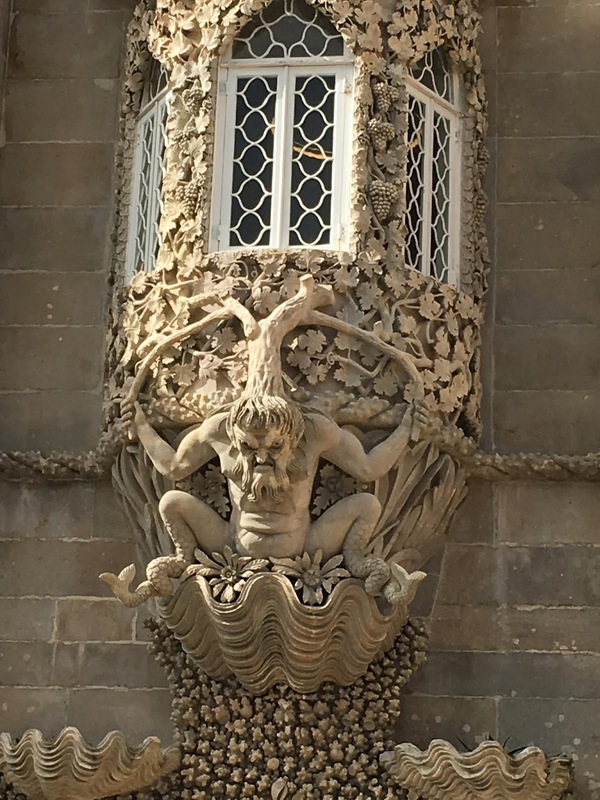 He was located on the exterior, just above the main entrance. We were astounded and delighted with the beauty and history in Sintra. We are glad that we made it to this area during our time in Portugal. Stunning! That castle certainly looks hard work. We certainly did a lot of walking and climbing around the castle. Over the years, I have explored quite a few castles, and this is one of my favourites so far because of the extent of it and the magnificent views. Wonderful pictures! It looks like you are having a lovely trip. Thank you! I took so many photos that it was hard to choose. 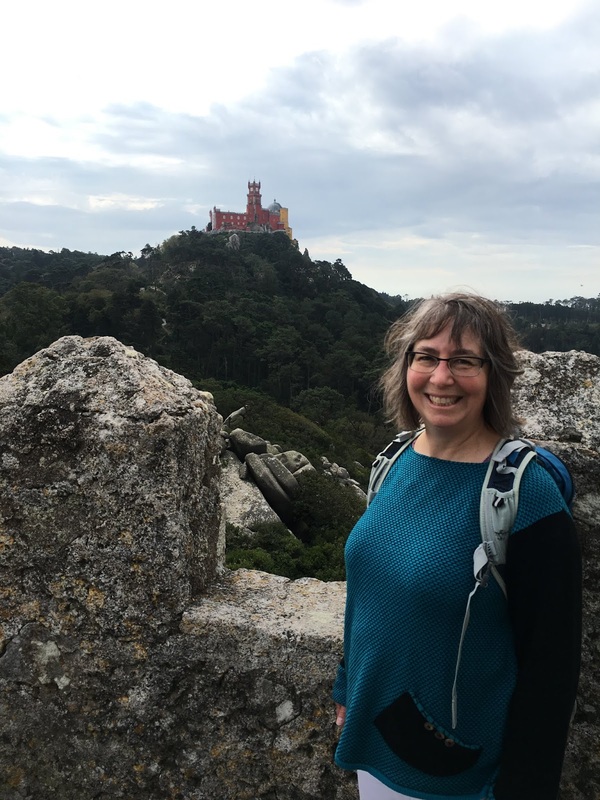 Kathy, we really enjoyed our time in Sintra. And we just barely scratched the surface of all this area has to offer. I had hoped to go over to the coastline which looks very rugged and beautiful. But somehow, we found ourselves short of time to do all we wanted. One other thing about Portugal - we found it quite affordable, compared to other parts of Europe. Thank you for taking me into parts of Portugal where I have never been. Awesome photos and post. I look forward to hearing more IRL. Let's catch up soon! Thanks Donna. I’d like to catch up in person when we’re both back on the Island. Are you back now? Stopped over ... I've been to Spain, never Portugal. Now I want to go to Portugal! Also ... nice post about your mom. Hi Tom - thanks for commenting! I went to Spain in the 1970s as a young person backpacking around Europe, but somehow missed Portugal. My first time to go there was in 2011 and we really loved it, so we went back again this year. We had a great visit again. Thanks for mentioning my Mom. I really miss her. Hi Jude - So glad you visited Portugal and are enjoying the beautiful sights there. 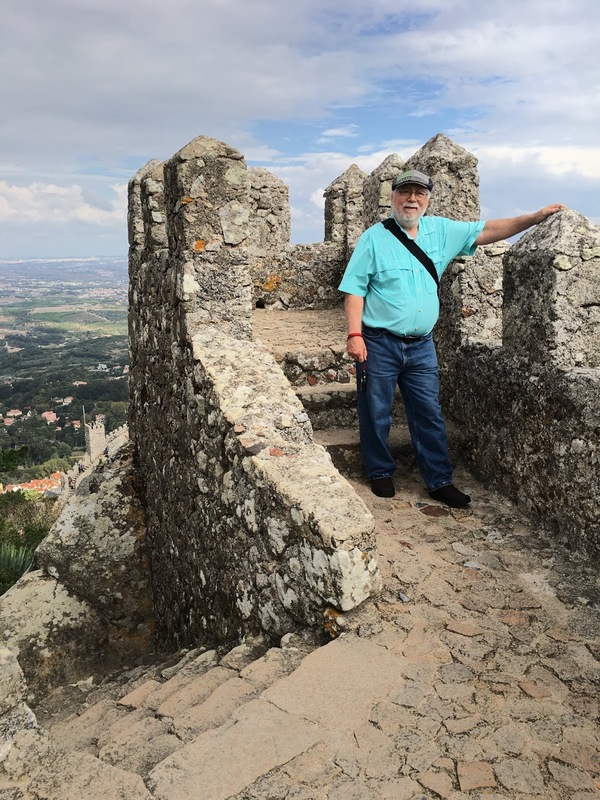 I visited Lisbon, Sintra, and Albufeira in the Algarve a few years ago. I love all of these places. Thanks for sharing your travel updates and photos. Natalie, Portugal is a small country, but there is so much to see there. On the first trip we toured the Alentejo region and the Almargem south of Lisbon. On this second trip we started in Lisbon, and then went north. Based on your two day visit and photos, I have to put Sintra on my Portugal list, Jude. How beautiful, the castle and the palace. 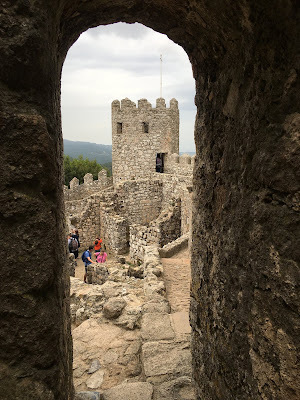 I love exploring castles and walking along the outer walls, taking photos of the architecture and enjoying the views. These two top of the hill destinations are awe-inspiring, yet very different. Thanks for the virtual tour! 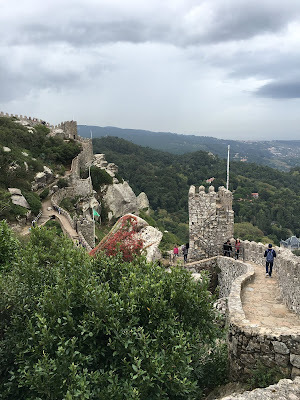 Liesbet, there are at least six very significant historical buildings in the Sintra area that one can tour, but these are the two that we chose to look at, and we were not disappointed. The other thing that is really interesting is the rugged landscape in this area, which yields fantastic views.